The focus was on joint steering and braking actuations. Two specific areas were investigated: continuous driving support and emergency interventions. Collision avoidance have thus become more effective. New technologies for the dynamic prediction of a safe trajectory ahead. Decision strategies leaving the final control to the driver in all cases. Advanced human machine interface (HMI) concepts integrated into the primary driving controls. 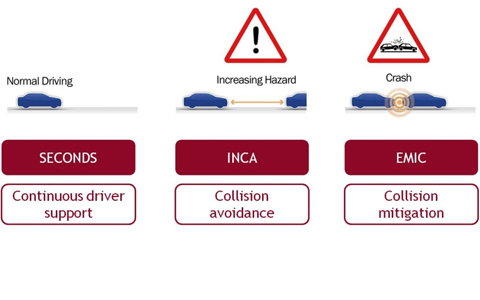 ADAS concepts for reducing accident severity have been further developed. Specific attention was given to vehicle architecture in the low-medium segment of passenger cars, and on cost effective sensors in combination with relevant accident scenarios. One main target was to integrate the environment sensing information as a part of the perception layer, including the inertial sensors, digital maps, and vehicle-to-vehicle as well as vehicle-to-infrastructure communication. interactIVe continued the work of PReVENT and other European projects by using structured methods for the evaluation of safety functions. A modular evaluation framework was being defined to co-ordinate all testing.